Another Day, Another Mass Shooting . . . Unfortunately, nothing is new in the latest mass shooting--just another young, "upset" white guy who picks up a gun and shoots a bunch of people. In response to which, 45 takes a break from golf to fill a little airspace with meaningless word bubbles: thoughts and prayers, a guy with "problems," "this isn't a guns situation." And maybe, as more details are released, there really is nothing new here. A violent young man, who has previously beaten the crap out of his wife and small child, packs up his guns (a Ruger AR-556--a "military style" semi-automatic "tactical rifle"--and two handguns, a Glock 9mm and a Ruger 22-caliber), heads off to a place where he can find lots of easy targets, and starts firing. In this case, the shooter chose a church that his in-laws attended--although, as it turned out, they were not in the church on Sunday morning. But that didn't make any difference to the shooter. Twenty-five innocent men, women, and children are now dead. As the research group Everytown for Gun Safety reported just months ago, "domestic violence is a driving factor in mass shootings." The data published in Mass Shootings in the United States: 2009-2016 (March 2017) makes the link between domestic violence and mass shooting painfully obvious. In the eight years under analysis, there were 156 mass shootings in the United States using FBI definitions for what constitutes "mass murder": "a number of murders (four or more) occurring during the same incident, with no distinctive time period between the murders. These events typically involved a single location, where the killer murdered a number of victims in an ongoing incident." These 156 "mass shootings" resulted in 848 deaths and 339 injuries. The majority of the cases--"at least 54%," or 85 of the 156 incidents--"were related to domestic or family violence" (3). The carnage is shocking: 422 victims killed, 40% of them children (3). The data in Mass Shootings was drawn from FBI homicide statistics and "media reports." Now that the FBI (and Department of Justice) have scrubbed pesky data like the relationship between murderers and their victims and the ages of homicide victims from their annual Crime in the United States report, good luck keeping track of the numbers . . .
Just another deranged guy with a gun? Here's a modest proposal for what to do. 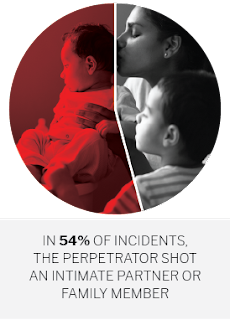 Update, 9 November 2017: For more on this topic, you may be interested in this podcast from WBUR (Boston) and its On Point broadcast, "The Link Between Domestic Violence and Mass Shootings" (9 November 2017)--to listen, click here. One of the people interviewed for this broadcast is German Lopez, senior reporter for Vox. To read his piece, "America's Domestic Violence Problem is a Big Part of Its Gun Problem," click here.